* This is it folks! My most obscure story yet, and that's saying something if you've read past blogs, covering everything from tractor development in Ulster & hamster hunting in the Yemen to the strange sport of Road Bowling. But I do find this story intriguing. So I'm compelled to share. It's the true tale of the Ulster Presbyterian Cowboy who lit up the lives of schoolboys all over the world with his romantic tales of adventures in exotic lands from Tibet to Texas. It's the story of the now totally forgotten Captain Thomas Mayne Reid. * He was, in terms of sales and reach, the most successful Irish author of the 19th Century. His breathless tales of adventure (and botany) amongst the plains Indians of North America or the Lamas of Kathmandu were translated into scores of languages and inspired everybody from Sir Arthur Conan Doyle and Vladimir Nabokov to Nobel laureate Czeslaw Milosz and US president Teddy Roosevelt. In his time, he was considered a serious rival to Jules Verne. Edgar Allan Poe sang his praises. The two met in Philadelphia and became great drinking buddies. He fought, bravely, for the young US nation, built a Mexican hacienda in suburban London and married well, before dying of "severe melancholia", broke and forgotten. But his fame would live on for generations of schoolboys, including a young Vladimir Nabokov. who at 11 years of age, translated his best known novel "The Headless Horseman" from English prose into French alexandrines (a type of poetic metre favoured for romantic epics). He was Captain Thomas Mayne Reid of Ballyroney, Co Down (and all parts North, South, East and West). Born the son of a Presbyterian Minister in Ulster in 1818, he studied first for the church and then worked as a schoolteacher in his native land before becoming restless and heading for the United States in 1840. He arrived in New Orleans and embarked on a colourful life as fur trapper, frontier school-master, and society writer for a Philadelphia newspaper (where he met with Poe and became a fast friend and drinking companion). It was after the war, while recovering from his wounds, that he started to write seriously, while living in Ohio with an army buddy called Donn Piatt, who would go on to become famous in his own right as a Union General in the Civil War, wealthy publisher, patron of the arts and builder of gothic castles in the prairie lands of the West. It was in London, in the early 1850's, that Reid began to find success with a line of adventure novels for boys, with titles like The Scalp Hunters, The Headless Horseman, White Squaw And Yellow Chief. In total, he would write around 75 novels and many short stories and sketches - many were published in part-work in periodicals or sold as what would become to be known as dime-store novels. These were florid, sentimental, wildly adventurous tales of cowboys and Indians, tales of the Prairie Lands and the West (only then being opened up), of Mexican banditos, brave cavalry officers, trappers, prospectors and explorers. One curious feature of the novels is his fascination with botany and natural history. Quite often, Mayne Reid would include the latin names of the plants or animals that featured in his stories, lines such as; "the cowboys heard a noise from just over the bluff, and began to crawl through the sage brush (Artemisia Tridenta).. far off in the distance, the sound of restless buffalo (Bison Bisonus)..". One reviewer pointed out that the Irishman had missed his calling and should really be writing for a scientific journal. His novels were hugely popular and found an audience around the world, especially in Poland and Russia where he was still a hero to schoolboys right up until the 1960s. Reid became very famous and very rich. But he appears to have had a poor way with money and business. He sunk a large fortune into building an authentic Mexican Hacienda in North London (now, sadly gone) and found that as his style became very dated in the US and Europe, his money ran out quickly. He died in 1883 in London (at the age of 65 and is buried in Kensal Green Cemetary, his gravestone bearing a line from The Scalp Hunters; "This is 'weed prairie'; it is misnamed: It is the Garden of God." He influenced a generation of schoolboys. President Teddy Roosevelt called him "one of the greatest inspirations of my life" and credited him with sparking a love of the outdoors and wild places which helped push the grown up Teddy into establishing the first National Parks. Sir Arthur Conan Doyle - writer of the Sherlock mysteries - credited him as a major influence and inspiration. Nabokov, in his autobiography Speak, Memory, name-checks all of the great writers who inspired him. But one gets more prominence than Blok, Pushkin, Flaubert, Kafka, Tolstoy etc. And that is the writer who "totally captivated me as a boy, a writer of Wild West Romances, Captain Thomas Mayne Reid". 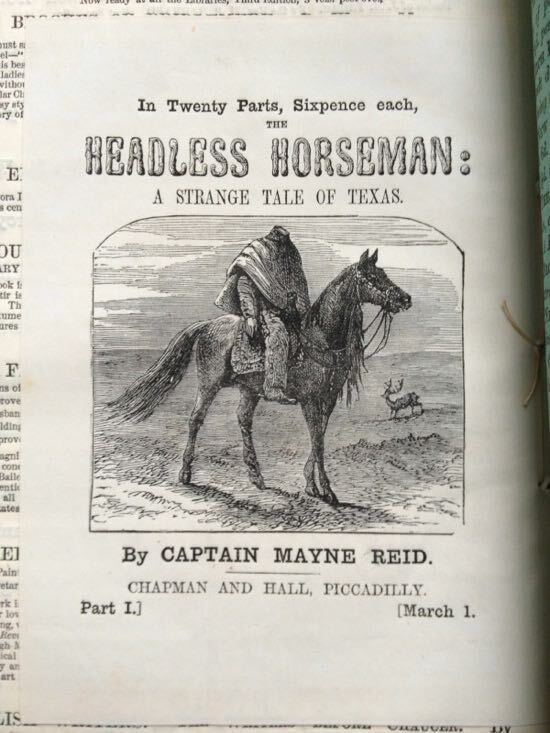 Nabakov even admits to re-reading The Headless Horseman, his favourite, in adulthood and spends quite a while in his biography analysing the Mayne style and quoting his favourite lines (such as the description of a glass decanter glimpsed behind a Texan saloon-keeper; "an iris sparkling behind his shoulder". He is almost totally forgotten now. But Thomas Mayne Reid inspired a generation of schoolboys to do everything from explore the world and run for president to put pen to paper. * This is from the Spectator Magazine of London, from the long obituary published shortly after the writer's death. "The real cause of the popularity of Captain Mayne Reid's novels, which, as regards one or two of them, may last long, is that they gratify not the boyish, but the human love for pure romance, for stories in which there are practically fairies, though they are called Mexican ladies, and genii, though they are dressed as American filibusters, and devils, though they appear as Don Rafaels or Antonios ; and probabilities are set aside, and every- thing happens as it is convenient it should happen, and nobody cares a dump whether there are any laws, human or divine, or not. Adventures are adventured, and the adventurers fall into frightful dangers, and get out of them again by wonderful means; and laws, literary or other, are simply a burden. That is the secret of the "Arabian Nights," and it is that of Mayne Reid, as is also that of the indefinitely abler novels sold in such scores of thousands by Jules Verne"